In the Homeland C4 ad break on Sunday evening, something very rare happened. An ad made me cry. It’s a very simple, John Lewis-ey kind of concept for Quality Solicitors (a kind of holding brand for a group of independent solicitors all over the country) and could easily have got lost as just another ‘snippets of life’ execution…but for some reason it moved me. I don’t have kids, so John Lewis’ kid-on-Christmas-morning didn’t tug at my heart strings the way it did for parents. But Big Life Events like birth and death move everyone, no matter what their current personal situation might be. Add in the kind of Life’s Challenges that one or more of which will have affected most people in some way – redundancy, divorce, setting up your own business, moving house and you have a very compelling proposition along the lines of We’re here to help you through all your Big Life Events and Challenges. Judging by twitter the ad divided opinion a bit, but far better to connect on an emotional level (good or bad) than be faced with a reaction of mass indifference. 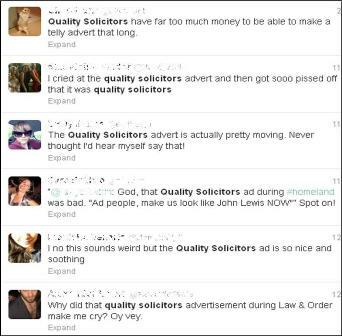 Personally and from a Planner’s point of view, I would have liked the end of the ad to make it a bit clearer exactly who Quality Solicitors are – nationwide but local lawyers – as I had to google them to be sure before I wrote this. But overall, top marks to Team Saatchi (and nice spot choice from MediaCom Edinburgh too). I thought it was far far better than anything you would expect from a soliticor firm, just a shame their name is so poor. The brand name actually spoilt the ending for me.